This property is conveniently located within walking distance of the exciting casinos. 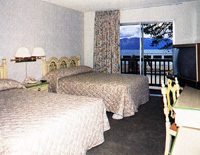 All rooms have their own private balcony so you can enjoy the most breathtaking views of Lake Tahoe and the Sierra Mountains. Complete kitchens are available in some rooms. Enjoy a leisurely deluxe, continental breakfast outside at patio tables overlooking beautiful Lake Tahoe during the warmer months, or comfortably inside during the winter months.